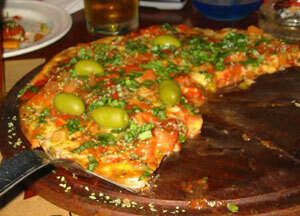 Pizza in Buenos Aires is totally different than what you might be used to coming from the US. Argetina was settled heavily by Italians, who brought with them some of the best ice cream, past, and of course pizza in the world. So it is an understantement when I say that Pizza in Argentina is serious business. So I won’t. Instead, I’ll let Alan Patrick of BuenosTours tell you. Alan is a cake-a-holic philosopher turned Buenos Aires tour-guide and blogger, which puts him in a perfect position to tell you about the history of Italian food in Argentina, and also about one of the best pizzerias to be found in Buenos Aires. Not only that, but his blog travel guide, aptly named Buenos Aires Travel Guide, is a great resource on Buenos Aires, its attractions, its restaurants, its accomodations, and its charms. Hi César, thanks for the shout out! This page rendered in 0.041 seconds.